We are in Varanasi now and wish all of you. We are happy to inform you that our tour for Europe this year will be in October/ November 2012. So we are starting now for booking the Concert dates of Europe and just like to inform you that if you want to book any concert of us then please contact us soon as now we are booking the dates. We are coming three musician Pandit Shivnath Mishra, myself Deobrat Mishra on Sitar and Prashant Mishra on Tabla. So please contact us soon for any information you need. My father Pandit. 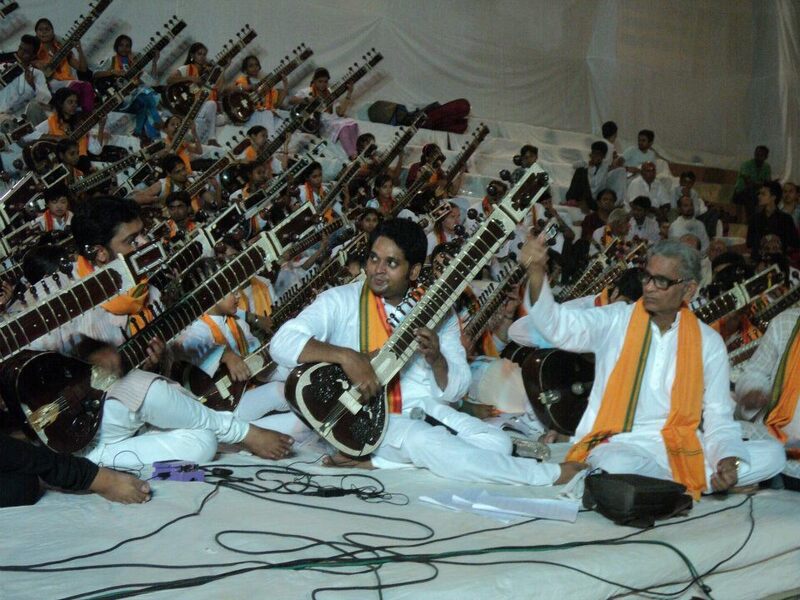 Shivnath Mishra made a history in Varanasi-India to conduct a orchestra of 108 sitar players. Total musician where 151 including Tabla players and Flute players. Varanasi (Sanskrit: वाराणसी ) is a city situated on the banks of the River Ganges in the Indian state of Uttar Pradesh, 320 kilometres (199 mi) southeast of state capital Lucknow. It is regarded as a holy city by Buddhists and Jains, and is the holiest place in the world in Hinduism (and center of earth in Hindu Cosmology). It is one of the oldest continuously inhabited cities in the world and probably the oldest of India. The Kashi Naresh (Maharaja of Kashi) is the chief cultural patron of Varanasi and an essential part of all religious celebrations.The culture of Varanasi is closely associated with the River Ganges and the river’s religious importance. The city has been a cultural and religious centre in North India for several thousand years. Very rare to see three generation master musician’s on same stage. From their home city of Benares, an ancient spiritual centre of traditional music and Indian culture, “The Mishras” are bringing classical North Indian Ragas and meditative music to the world audience, gifting the audience with a fabulous performance and a spiritual experience. Join this father and son duet of two of the worlds finest Sitar Artist and Prashant Mishra on Tabla grandson of Pandit Shivnath Mishra as they inspire one another to new levels of loving interplay. Born in 1976, he represents the 11th generation of the Benares Gharana tradition. As a young child he studied tabla with his mother, Pramila Mishra, who is the granddaughter of the well-known tabla player Pandit Baiju Mishra. He started by studying vocal music with his father at the age of five and began his sitar lessons a year later. That same year, after only six months of studying the sitar, he gave his first public performance on stage. Five years later, he performed for the first time on the All India Radio. Since 1994 he has been touring throughout Europe with his father. In the same year he was chosen to receive the award of the best young sitar player of India. In 2000 he received the “Jewels of Sound Award” in Mumbai. His many projects include music workshops, solo performances for radio and television as well as world music programs with Indian and European artists. Moreover, he is the one in charge of cultural events and music lessons provided by the Academy of Indian Classical Music, the school he founded along with his father, Pandit Shivnath Mishra, in 2006. Recently, he received a Masters degree in sitar from the Prayag Sangit Samiti in Allahabad. Among many other projects, the Mishras performed and recorded their music with the Western Symphony Orchestra of Italy in 2005. Nowadays, they fully dedicate their art to similar projects including annual tours around the world. Prashant Mishra is one of the best young Tabla player of benares music tradition. When he was five he started to learn tabla with the family member of Biru Mishra of Varanasi also studying Tabla presently with Mr.Chakkan lal Mishra(Student of Great Tabla player Anokhelal Mishra.. Soon after few years of hard practice with his grandfather Pandit Shivanath mishra and uncle Deobrat mishra he was able to perform with Mishras His skills beautifully compliment and support the Mishras in their concerts. In 2004 he won first prize in Tabla competition organized by Sangeet Natak Academy Uttar Pradesh India. He received many awards for his tabla playing at many different places. The Mishras tour will help to support the Academy Of Indian Classical Music School in Varanasi, India. Additionally, the Mishras support their Academy of Music in Benares, India where they keep alive the tradition of their music amongst young musicians. Every January and February, the Academy is open to international students of all ages and skill levels. These study tours to India are a cultural experience combining ashram style living and intensive music instruction in one of the world’s oldest cities. Note: Mishra or Misra (Hindi: „मिश्र“ „मिश्रा“) is a Hindu Brahmin surname found mostly in the northern and central parts of India. It is one of the most widespread Brahmin surnames in the fertile Gangetic plain region and in the Indian states of Delhi, Bihar, Uttar Pradesh, Uttarakhand, Madhya Pradesh, Rajasthan, Orissa, Assam and West Bengal. It is also found in countries such as Guyana and Trinidad and Tobago under the anglicized version of Misir, due to migration owing to agricultural/plantation employment. The surname is also found in Nepal, Fiji and Mauritius, as well as in other Indian diaspora communities. 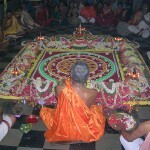 In Hinduism, Brahmin refers to the class of educators and preachers. It is the highest class in the caste system. There are many references in the Ramayana and Mahabharata about the importance of a Brahmin. In the Vedic period, the Brahmins preferred isolation and solely dedicated their life to propagating knowledge and Dharma. However Misras have historically been martial Brahmins and in earlier years, many were drafted into the army. Lok Virsa (The National Institute of Folk & Traditional Heritage) works towards creating an awareness of cultural legacy by collecting, documenting, disseminating and projecting folk & traditional heritage. Surveys and documentation of traditional culture is central to the objectives of the institute. The Lok Virsa delve into and surveys are conducting by mobile recording and filming units. Dedicated individuals undergo the rigorous field work, to bring back valuable results to the central archives and production facilities housed at the Lok Virsa complex at Garden Avenue Shakarparian Hills Islamabad. Lok Virsa is an affiliate member of UNESCO, The World Craft Council, International Council of Music, The Asian Cultural Centre for UNESCO, The International Council of Museums and similar other world organizations for the dissemination of art products abroad. Zamana is a public interest space for learning, reflection, and action on Pakistan. Explore: Whose Land? Whose Food? Sign the petition to raise your voice against land leasing to foreign clients. UPDATE 23.11.2011 Final Declaration: Stop Land-Grabbing Now! More than a hundred civil society organizations have submitted a document entitled „Time to Act – Agriculture and Food Security and Rio+20“ as input to the UN Conference on Sustainable Development (the Rio+20 conference). The submission outlines the key actions that are needed to achieve viable food systems based on agroecological and other forms of sustainable production. A global youth mobilization towards the UN Conference on Sustainable Development (Rio+20). http://www.timetoactrio20.org/ 20 years after the Rio Earth Summit, the planet is in a deeper environmental, energy and financial crisis.The United Nations Conference on Sustainable Development (UNCSD) in Rio de Janeiro in 2012 might be just another high-level conference stating the need to eradicate hunger and poverty, stop climate change, the loss of biodiversity, soil erosion and other serious environmental problems – and then, after the conference, life goes on as before. But it can be different. It has a historical opportunity to make important decisions and agree on actions that actually do eradicate hunger and poverty, and save the environment. It’s time to act! Many civil society organizations have signed on to a document with proposals on issues linked to food and agriculture for the Rio2012-conference. Download the document (PDF) HERE. Download the document in Word format (doc) HERE. 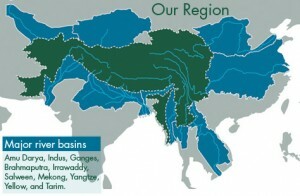 UPDATE 24.11.2011 @guardian – Africa’s great ‚water grab‘ Foreign investors aren’t just after land in Africa. Access to water is essential – which can bring them into direct competition with the needs of local communities. ein letztes Mal für dieses Jahr kommt Shri Sarvabhavana nach Wien um Beratungen zu geben. Er wird am Sonntag den 23.10 in Wien ankommen. Vielleicht gibt es die Möglichkeit auch am Sonntag Nachmittag Termine anzubieten, aber nur falls dies dringend notwendig ist. Ansonsten besteht das Angebot am Montag einen von sechs Terminen und am Dienstag einen von drei Terminen wahrzunehmen. Am Mittwoch(Nationalfeiertag Ö) wird es einen spirituellen Vortrag in Klagenfurt geben. Genaue Infos auf Anfrage. Ghulam Mohamad Saznawaz is the only existing master of Kashmiri Sufiyana Music in the world. The most tragic part of Kashmiri sufiyana music is that with the Maestro Ghulam Mohamad Saznawaz the art will be lost to posterity, now very old with his age the mastero has opened a school to teach Kashmiri Sufiyana Music free of charge but this school does not attract many students from Kashmir because of the religious and social prejudice among the majority of Kashmiris. This is sad but its true that still musicians are considered as of a lower class or of low moral and as if they can not do something useful thats why they chose to be musician. With the goal of uniting conservation, communities and sustainable travel, TIES is committed to promoting the principles of ecotourism and responsible travel around the world. Message to World – Indian Heritage on science and technology has a history of not less than 5000 years starting from the subjects of mathematics, astronomy, geometry, health science, food science, yoga, Metallurgy (science of metals), space science /air crafts technology, plant science and so on. 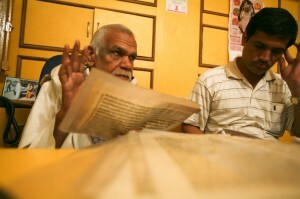 There are thousands of books catalogued by different organizations and institutions in India and abroad, which are presently available either in the printed form or as manuscripts in palm leaves. This history record, starts from Vedic period. The mathematics and astronomy were dealt together in hundreds of text books written in Sanskrit and in regional languages. 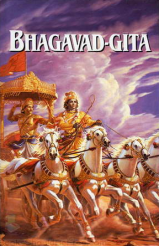 Mahabhaskareeya, Laghubhaskareeya, Vateswara Siddhanta, Bruhat samhitha, Sidhanta siromony and many similar books still available in the printed form with English commentaries. They give the subject matter qualitatively and quantitatively at par with the modern developments. The books on health science, Charaka Samhita, Susrutha samhitha, Ashtanga hrudaya and so on written many thousand years ago are the part of curriculum in more than 300 ayurveda colleges in India and more than one hundred institutions outside India. Indian heritage on the metallurgical sciences (loha thanthra, rasa saastra and so on) also goes back from the period of Yajurveda. Many ancient textbooks describe the rasa sastra and artha saastra giving detailed descriptions on the ores, minerals and methodology of extraction and purification of metals and their compounds, which has been supported by the archeological evidences. Indian technological heritage has vast area of knowledge from metallurgy, ceramics, glass, textiles, furnaces, leather, civil engineering and architecture, granite and marble, and so on. These are clearly demonstrated in ancient Indian books, cave temples, temples, forts, palaces, etc..
Indian Institute of Scientific Heritage (IISH) was established on the Sravana Pournami day in August 1999 and registered as a charitable trust (328/99/iv) during the last quarter of 1999. 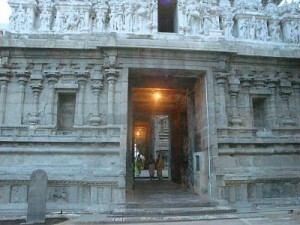 Then onwards IISH has been undertaking the mission of learning and teaching the ultra ancient heritage of Bharath(India) using ultra modern scientific and technological tools. The ultimate aim of this mission is to make every Indian proud of his heritage. Our aim is to inform the world about the glorious scientific, rational and logical heritage of India and also inform the world to practice and adopt these message in their life to lead a happy life in the 21st century. 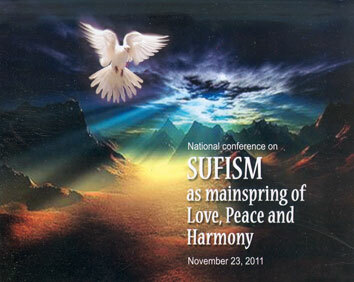 IISH is undertaking this mission of taking the message to 100 million people before the 31st December 2010. Hundreds and thousands of mission oriented workers are taking part in this patriotic mission of spreading the message of our motherland. We learn and teach the past glory, present achievements and future aims of Indian in each and every field, taking the inspiration for the past glory of this nation. We inform the world that this heritage of India is the property of Hindus, Muslims and Christians of India and also belongs to all beloved children of this motherland. Thus IISH spreads the scientific, technological, spiritual, sociological, anthropological, managemental messages to the world, in such a way that these messages can be adopted for the modern world. A shakha (Sanskrit śÄ�khÄ�, „branch“ or „limb“), is a Hindu theological school that specializes in learning certain Vedic texts, or else the traditional texts followed by such a school. An individual follower of a particular school or recension is called a śÄ�khin.- the term is also used in Hindu philosophy to refer to an adherent of a particular orthodox system. The Vedas comprise a vast corpus of Sanskrit poetry, philosophical dialogue, myth, and ritual incantations developed and composed by Aryans over 3,500 years ago. Regarded by Hindus as the primary source of knowledge and the sacred foundation of their religion, the Vedas embody one of the worlds oldest surviving cultural traditions. The Vedic heritage embraces a multitude of texts and interpretations collected in four Vedas, commonly referred to as books of knowledge even though they have been transmitted orally. The Rig Veda is an anthology of sacred hymns; the Sama Veda features musical arrangements of hymns from the Rig Veda and other sources; the Yajur Veda abounds in prayers and sacrificial formulae used by priests; and the Atharna Veda includes incantations and spells. The Vedas also offer insight into the history of Hinduism and the early development of several artistic, scientific and philosophical concepts, such as the concept of zero. Although the Vedas continue to play an important role in contemporary Indian life, only thirteen of the over one thousand Vedic recitation branches have survived. Moreover, four noted schools in Maharashtra (central India), Kerala and Karnataka (southern India) and Orissa (eastern India) are considered under imminent threat. The Vedic literature that has come down to our times is attached to various traditional schools of recitation and ritual called the ‘shakhas’. All the four Vedas have more than one shakha extant. In the past, the number of shakhas studied was many times more. According to the Mahabhasya of Patanjali, there were 21 shakhas of Rigveda, 9 of Atharvaveda, 101 of Yajurveda (86 of Krishna Yajurveda and 15 of Shukla Yajurveda, according to later authorities) and a 1000 varieties of chanting of Samaveda. Maybe, the number 1000 for the Samaveda merely refers to ‘numerous’. Nevertheless, although only 20 or so Shakhas of the Vedas are extant now, we do possess names of most of the lost Shakhas of the Rigveda, Yajurveda and Atharvaveda. Fragments of many of the lost shakhas are also available as quotations in ancient works. For the Samaveda, we do not have more than 40 names extant. 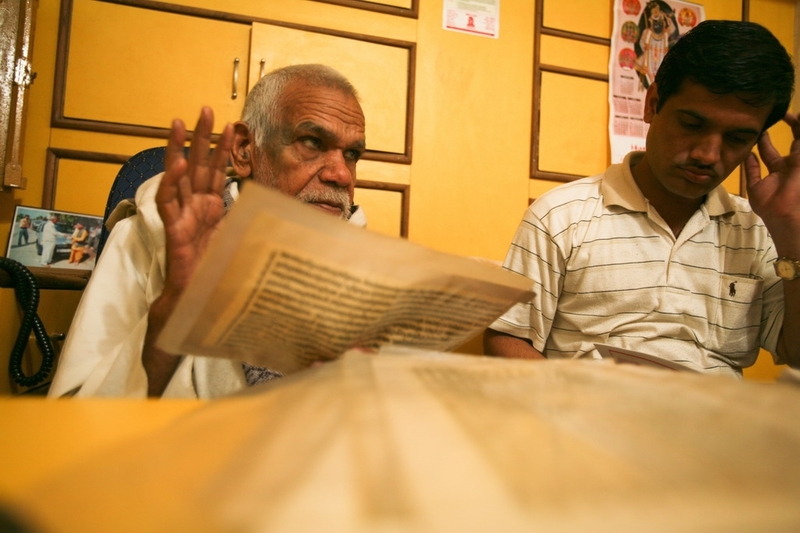 Two different Vedic shakhas might share one or more texts amongst themselves. Conversely, the distinction between two shakhas of the same Veda might result from the use of a different Samhita text, and/or a different Brahmana text, and/or different Kalpasutra text and so on. For e.g., the Baudhayana and the Apastamba shakhas use the same Taittiriya Brahmana, Taittiriya Samhita and Taittiriya Aranyaka but follow different Kalpasutras. On the other hand, the Shankhayana and the Kaushitaka shakhas use the same Samhita and Shrauta Sutra but their brahmanas have slightly different readings and their Grhyasutras are quite different. A group or a community of people who study a particular shakha in its entirety (Samhita + Brahmana + Aranyaka + Kalpasutra + any additional texts) and perform its ritual constitute a ‘charana’. For instance, Brahmins who study the Taittiriya Samhita/Brahmana/Aranyaka together with the Kalpasutra of Apastamba say – “I follow the Apastamba charana’. In certain cases, we have instances of ‘mixed shakhas’. For instance, the followers of Shakala shakha have adopted the Kalpasutra of Ashvalayana. The Ashvalayana shakha, which had the now well-known Ashvalayana Sutra, has in turn lost oral traditions of its Samhita. 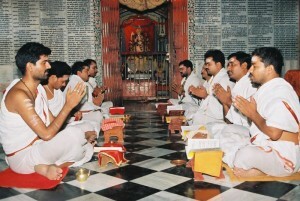 Likewise, the Kaushitakins of Kerala often use the Samhita of Shakalas. 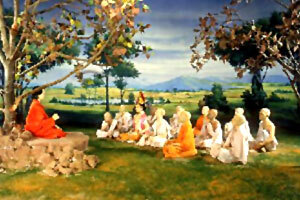 The various shakhas of the Vedas were, at one time, spread throughout South Asia. Their geographical location has not been constant down the ages, as communities of Brahmins professing a particular shakha migrated from one part of India to the other, or adopted another shakha when it became impossible for them to sustain the tradition of their own shakhas. The KOA organization has its origins in the early meetings of several Kashmiri > Pandit < families in the Washington D.C. and Maryland areas. These families soon came to realize the importance of building a community structure which could include other families too in a bond for mutual preservation and growth. As more families and members joined the founding group, the organization evolved to become a national outfit with regional chapters, documented bye-laws, systems and procedures as well as a non-profit status to better seek donations and pursue community actions. Shriya Bhat Mission Hospital and Research Center: Since then the hospital is working as a multi-disciplinary clinic. Over the years some amenities have been added like an air conditioner, refrigerator, ECG machines, glucometers, nebulizers, traction apparatus etc. A medical van has been kept at the disposal of the sick patients. The Center is open to every body irrespective of cast or creed, region or religion. There is a work force of consultants in internal medicine, neurology, general surgery, urology, orthopedics and dermatology in regular attendance. Patients are registered for examination and treatment round the week. The mission hospital has so far rendered its services to more than 35 thousand patients. All the patients receive a free 3-4 week supply of available medicines. A mini laboratory helps with some basic investigations, again conducted free on the patients. Sharda Peeth Rishi Model School, Udhampur, J&K: In 1990, terrorism and sectarian violence caused nearly 500,000 Kashmiri Hindus to flee the land of their ancestors, the fabled valley of Kashmir in the Indian state of Jammu and Kashmir. These victims of terrorism, refugees in their own country, left behind virtually all of their worldly possessions as they had to flee under threat to life and honor. As in most situations, the worst sufferers of this violence were the children of this displaced people. With their parents consumed with, yet often unable to, provide the basics of living to their families these unfortunate children were often left without the only hope for a better life – a healthy education. The Rishi Memorial School was started in the mid-1990s with contributions from a group of US-based Indian-Americans concerned for the future of these indigent children. This remarkable experiment in social self-service began with only about a dozen students and one teacher. Save a Smile – Sponsor a Child: The refugee camps in Jammu and Kashmir house hundreds of thousands of Kashmiri Pandits displaced from their homes as a direct result of the Islamic militancy in the valley. This tragedy has resulted in children being denied the opportunities that we take for granted. Since 1995, the Kashmiri Overseas Association, USA has implemented the Sponsor-A-Child Program for the age group 5 year olds to 17 year olds. 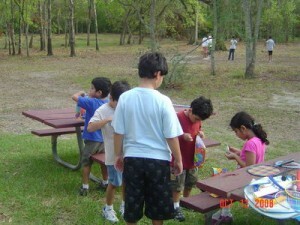 This program aims to provide educational opportunities to the children directly affected by the tragedy. While individuals worldwide have contributed to these programs more children are in need of our financial support than currently available funds can support, there are many more that deserve our assistance. Goal: To provide tuition, school supplies and living expenses to school children who are currently living in refugee camps. Religion – The religious practices of Hindus of Kashmir (popularly known as Kashmiri Pandits) revolve around the worship of Shiva and Shakti. All other deities (gods and goddesses) of the traditional Hindu pantheon are worshipped as various manifestations of Shiva and Shakti. Shiva is the Supreme Lord of the universe and Shakti, the Universal Mother Goddess, is his eternal companion. Region Kashmir: Poetry of Nature – Set like a jewelled crown on the map of India, Kashmir is a many-faceted diamond, changing its character with the seasons always extravagantly beautiful. Three Himalayan ranges – Karakoram, Zanskar and Pir Panjal – snow-capped, majestic, frame the landscape from northwest to northeast. They are the birthplace of great rivers which flow down into the valleys below, forested with wild orchards and lily laden lakes. Vedic astrology was developed by the ancient sages of India over 5000 years ago. Called Jyotish, the science of the light of life, it is part of the Vedic wisdom. This includes Ayurveda, Vastu (Vedic architecture) and Yoga. The Vedas and the vast Vedic Literature, mankind’s oldest and most sophisticated body of knowledge, detail the relationship between astronomy, astrology and human beings. Vedic astrology is a powerful medium which can be used to understand ourselves through the study of the stars and the constellations. It predicts and offers remedies for mundane difficulties as well as guide posts to an individual’s spiritual path. Life Positive is a body- mind-spirit magazine promoting a holistic understanding of the unity of life and self with an emphasis on personal growth. It was started in April 1996 by Aditya Ahluwalia, chairman of the organisation, and Parveen Chopra, founder-editor, under the aegis of Magus Media Pvt Ltd. Produced by a team of professional journalists, some of who are also active seekers, Life Positive covers the beat of spiritual wisdom, techniques, gurus, personal growth therapies, alternative medicine, holistic healers and organisations with insight, accuracy, thoroughness and discrimination. From its inception the magazine hit an instant chord with the reading public and has carved a base of enthusiastic and loyal readers who appreciate its support on the growth path. The magazine also provides validation, support and a sense of belonging to all those who seek a life of joy, harmony, peace and self-actualisation. In today’s sensationalistic and negative publishing culture, Life Positive stands out as a repository of sanity, optimism, and responsible journalism that promotes higher values. 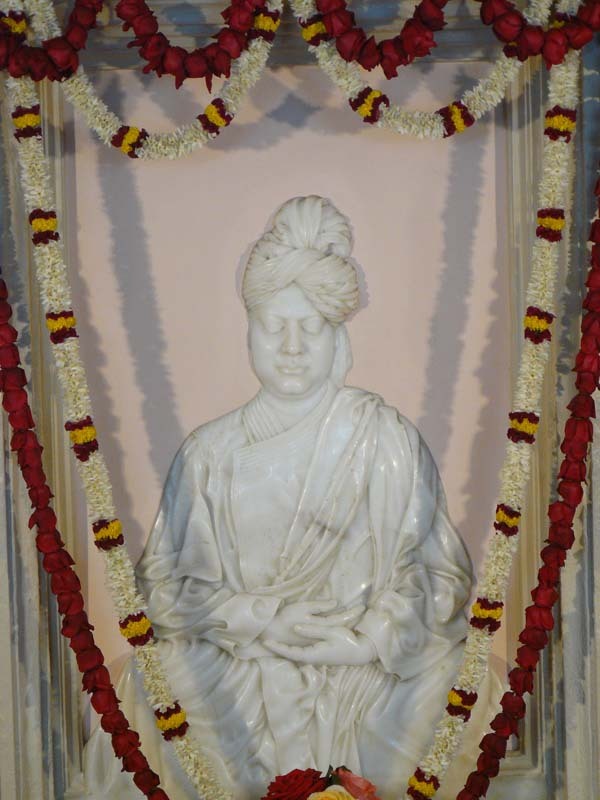 It can be credited with having pioneered the concept of spiritual journalism in India and for having created an altogether new niche in magazine publishing. It also influenced the publication of spirituality and health-based articles and sections in mainstream media most of which carry regular articles on the subjects today. The site Portal services: email, search engines and discussion boards are provided by third-parties, Everyone.Net and Google.com . Its orientation, as indicated by the name, is to consciously focus on the positive and ignore the negative. This is based on the spiritual law that what you place your attention on will thrive. In June 2005, the group launched its second publication, Life Positive Hindi. Within its short span of existence, the magazine has earned a strong readership base. The group has published a number of books, including Parallel Journeys and Nine Days to Nirvana and organised prestigious music festivals. The magazine is edited today by Suma Varughese who has been with the magazine since its inception and is the former editor of Society magazine. Life Positive is fortunate to have Mr D.R. 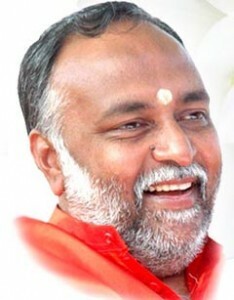 Karthikeyan, former chief of the CBI, as President. It also has a panel of eminent names as advisors including . Mark Tully, Kiran Bedi, Devieka Bhojwani, M Madhvan Nambiar, K M S ‚Titoo‘ Ahluwalia, G Venkatesh Rao , and Parveen Chopra.